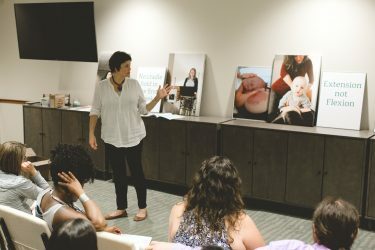 The Midwives of New Jersey attend births at Morristown Medical Center and Hoboken University Medical Center. Morristown Medical Center was named among the “100 Hospitals with Great Women’s Health Programs,” by Becker’s Hospital Review and ranked as a top hospital nationwide for gynecology by U.S. News and World Report. Hoboken University Medical Center has received several awards of distinction including an “A”, its top grade in patient safety, by The Hospital Safety Score, a service provided by The Leapfrog Group, and was recognized as a Best Hospital by U.S. News and World Report magazine. Both hospitals and their staff are very supportive and accommodate a wide variety of birthing plans and procedures including natural childbirth, vaginal birth after cesarean (VBAC) and those of the midwifery model of care. Hoboken University Medical Center is also now offering nitrous oxide as an option to assist laboring women cope with anxiety and pain. Our clients have tremendous flexibility in labor and are able to eat and drink, listen to music, ambulate or soak in the tub if they desire. We work very hard to create an environment within the hospital that is comfortable and conducive to the progress of labor. We keep the door shut, the lights dim, and eliminate all unnecessary procedures. We stay will our clients throughout their labor and delivery and enjoy every minute of it! If you are interested in having a waterbirth, Morristown Medical Center offers 3 patient rooms with birthing tubs as well as one portable tub for our low-risk client’s use. Hoboken University Medical Center has several portable tubs for our use and is in the process of designing 2-3 birth suites with birthing tubs designed to support women through physiologic birth. As of yet, we have had no difficulty in securing tubs for our clients.